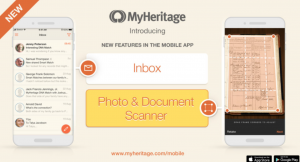 MyHeritage announced that they added two new features to their MyHeritage mobile app. These features were designed to improve user’s family history research. The MyHeritage mobile app is available for free on iOS and Android and it works great on smartphones and tablets.The mobile app allows you to capture and share family photos and memories right from your mobile device, update your family tree at family get-togethers, and invite family members to contribute to your family tree. The first new feature is called Inbox. It is a comprehensive email-based messaging feature you can use to communicate with other members of MyHeritage, including your own relatives. Use the Inbox to discuss DNA Matches, Smart Matches, and other topics of genealogical collaboration. MyHeritage recently announced that users can contact their DNA Matches in all contexts for free. This makes the Inbox even more useful. Correspondence that you initiate with your DNA Matches or other MyHeritage members can be continued wherever you are through the mobile inbox, even if you started that conversation on the desktop. Another new feature is called Scanner. This feature utilizes your smartphone’s high-resolution camera for scanning old photographs and documents directly into your family site on MyHeritage to preserve them digitally. The Scanner can enable genealogists and family historians to scan important documents while on-the-go. It could replace the portable scanner you might already be carrying. The new Scanner feature allows you to scan historical documents, as well as printed photos from old (or new) photo albums, easily and quickly. Whatever you scan in the app will be automatically uploaded to your family site on MyHeritage. Scanning documents and photos in the MyHeritage mobile app preserves them in a digital form, protecting them from physical damage. It also backs them up online so that you won’t risk losing them. It also allows you to tag items with individuals in your family tree for more organized record keeping. The scanner feature has been designed to be very easy to use. MyHeritage put together a scanner feature tutorial on their blog post about it. All you have to do is point and shoot, just like you would when taking a photo on your smartphone or tablet. The Scanner will automatically straighten out the object you’ve captured. Next, you can rotate the image or apply a filter to it. You can alter poorly lit photos, or faded documents, and make them much easier to see and read.